Complementing Monday's SSD review, we have another SATA SSD with customizable RGB LED lighting: Team Group's T-Force Delta RGB. Like the Kingston HyperX Fury RGB, this is a mainstream SATA drive augmented with RGB LEDs, which can be powered and controlled through a compatible motherboard header to illuminate the top of the drive case. However, the similarities between the two drives end there. 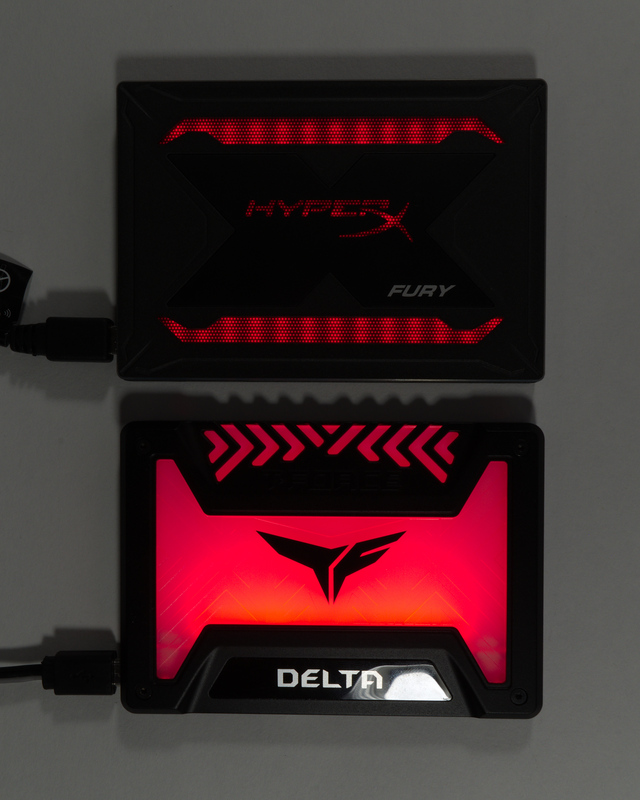 The T-Force Delta RGB SSD takes a very different approach from the HyperX Fury RGB for implementing the lighting. 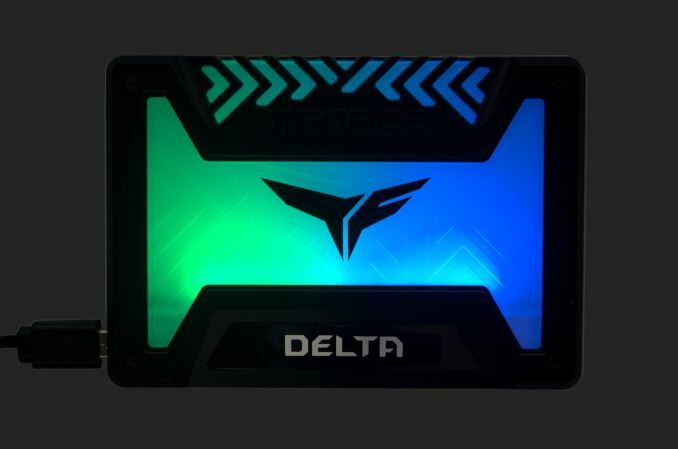 Where the Fury RGB put its LEDs on the back side of the SSD PCB, the Delta RGB uses a separate circuit board entirely. The top side of the drive is dominated by a textured clear plastic diffuser that is edge-lit by a single row of RGB LEDs. The T-Force Gaming logo is printed in black on this plastic piece and is silhouetted by the LED lighting, rather than being a directly illuminated logo as with the HyperX Fury RGB. Since the Delta RGB is only lit from one side there is some non-uniformity in brightness across the surface of the drive, but none of the localized variations in brightness that result from the Fury RGB's more direct backlighting. Overall the Delta RGB emits much more light than the Fury RGB despite using 8 RGB LED modules to the Fury's 75 modules. The Delta RGB uses a digital signaling protocol for its LEDs, allowing each of the eight RGB LED modules to be controlled individually, so the drive is not limited to solid color illumination. 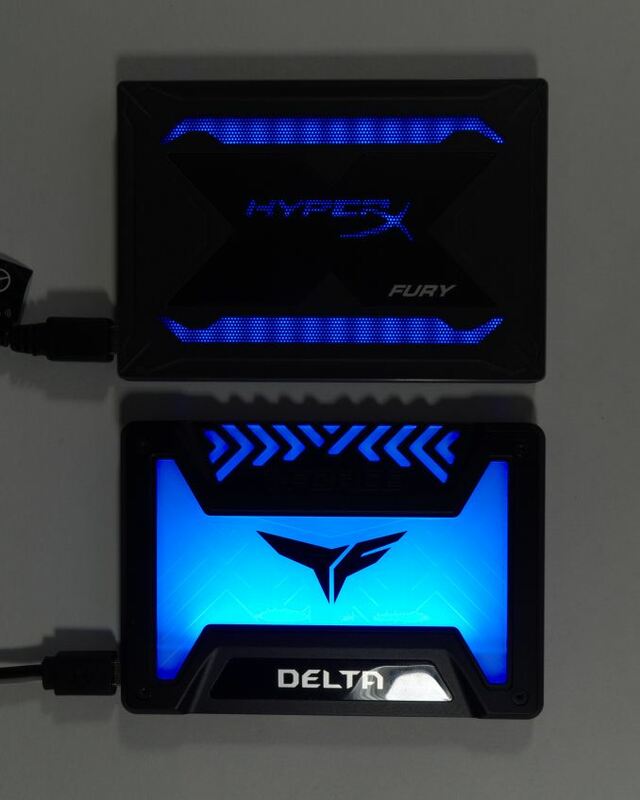 Even though the Team Delta RGB and the HyperX Fury RGB both reuse micro-USB type B connectors for their lighting, their adapter cables are completely incompatible and require different motherboard headers. The Delta RGB's LEDs run off 5V power while the much larger array of LEDs on the Fury RGB unsurprisingly required a 12V supply. Where the power consumption and heat generated by the LEDs on the Fury RGB seemed to be the cause of some performance problems and definitely made the drive warm to the touch, the Delta RGB's lighting solution doesn't seem to have any impact on the drive's storage functions. When a single color set of LEDs is illuminated on the Delta RGB the LEDs use a little over 0.5 W and setting the red, green and blue components all to full brightness only requires about 1.4W. By comparison, the HyperX Fury RGB requires about 2.3W for its LEDs when set to red and over 4W when everything is lit. Team offers a few cosmetic variants of the Delta RGB. The metal case can be had with a white finish instead of the matte black our sample uses. The Delta RGB reviewed here uses a 3-pin 5V digital interface for powering and controlling the LEDs, allowing the color of each of the 8 LEDs to be set individually. Team has also announced two versions with different lighting schemes: the Delta S using a 4-pin 12V header to set a single solid color for all the LEDs, and a Delta R with an animated rainbow color effect powered (but not controlled) off a USB 2.0 header. The Delta S doesn't seem to be currently available through the usual online retailers, but the more recently announced Delta R is in stock at Newegg. Aside from the RGB lighting, the Delta RGB is a fairly boring SSD. It uses the very familiar Silicon Motion SM2258 controller and Micron's last-generation 32-layer 3D TLC NAND, a combination we've dealt with several times before. Micron's first-generation 3D TLC NAND was produced in the unusual 384Gb (48GB) per die capacity. This means the Delta RGB has quite a bit more spare area to work with than a typical drive: the 250GB model has 288GB of flash. For some reason, our sample branded as a 250GB drive actually has the same usable capacity as a typical 256GB SSD. The larger models probably also offer slightly more usable capacity than they advertise, since there's plenty of raw NAND to go around even after setting aside a generous SLC write cache. However, the odd die capacity has a downside in that the flash is not optimally arranged. The 250GB Delta RGB only uses three of the four channels provided by the SM2258 controller. With a fast enough NAND interface this doesn't have to be a serious problem, but Micron's 32L 3D NAND wasn't particularly fast and we can't expect the Delta RGB to be setting any performance records. The transition to 3D NAND brought a jump in per-die capacities, and Micron's first generation of 3D NAND went a little too far with the 384Gb TLC parts. The consequences for consumer SSDs that almost exclusively used TLC were that low-capacity drives had very few dies to access in parallel. The performance hit that causes led to most product lines abandoning the 120GB capacity class, and many SSD vendors stopped providing review samples smaller than 480GB. 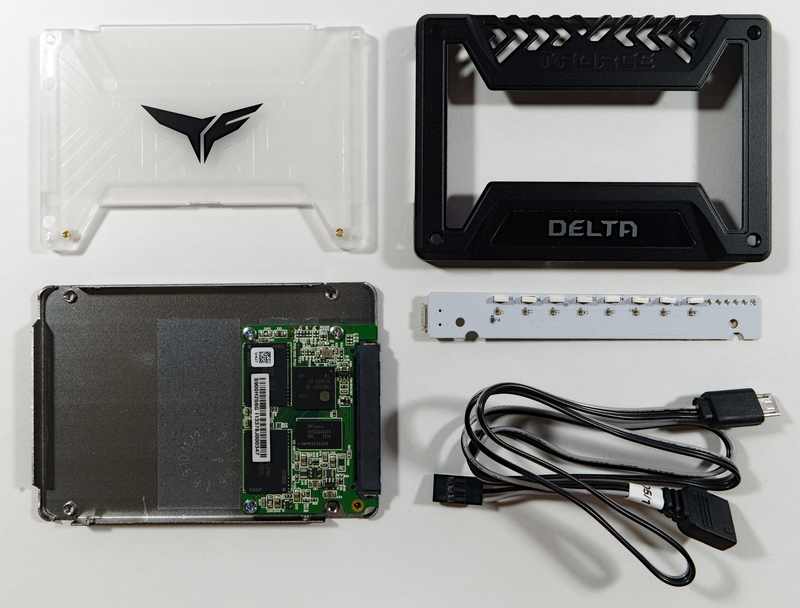 Since our Delta RGB sample is a 256GB drive, we only have one SATA SSD of comparable capacity using current-generation 64-layer 3D TLC to compare against, and that's the entry-level Toshiba TR200 DRAMless SSD. This review also includes several 480-512GB drives with 64L 3D NAND to compare against, but their higher capacity gives them a natural advantage for performance. The drives that are the closest to the Delta RGB in terms of performance expectations are the 256GB ADATA Ultimate SU800 and HP S700 Pro, both of which use the same SM2258 controller and Micron 32L TLC. Since the RGB LED lighting drives the price of the Delta RGB far beyond other mainstream or low-end SATA SSDs, this review also compares the Delta RGB to some NVMe SSDs with similar pricing. The MyDigitalSSD SBX is an entry-level NVMe SSD using Toshiba 64L TLC and the Phison E8 controller. The ADATA XPG SX8200 uses the more high-end combination of Micron 64L TLC and the Silicon Motion SM2262 controller, but in the 240GB capacity is isn't quite as fast as the larger capacities that compete well against the flagship NVMe drives from Samsung and Western Digital. The Delta RGB was put through our SSD benchmark suite with its lighting disabled, since our testbed's motherboard doesn't have RGB headers. The HyperX Fury RGB was tested with its red LEDs on at full brightness because that's its default behavior when the LED control cable is not plugged in, but the Delta RGB's LEDs are on an entirely separate circuit board from the SSD and cannot draw any power except through the LED cable. For the HyperX Fury RGB we report two sets of power measurements to reflect the total power draw including LEDs and the storage-only power draw from just the 5V supply. For the Delta RGB, we only report the power draw with the LEDs disconnected and off. What are some cases that would prominently display this SSD?